Hello to you! I hope this blog entry finds you well. As it turns out, I did not, in fact, fall off the face of the planet. I know I have been shirking my blogging duties lately, and for that I apologize. However, in my defense, the events in my life got excitingly erratic. Since my last blog post, I traversed Ireland, England, Holland, and Germany; I met Mick Fleetwood (perhaps the single coolest moment of my life so far); I molded the minds of students in four online composition courses; I have been bombarded with editing projects (whoop! ); and I have even been cruising through Kansas and Oklahoma with my storm-chasin’ man in pursuit of tornadoes (saw my first EF-4 this year!). So, all excuses aside, I’m back, and I dedicate this entry to you, my dear readers. I mentioned I have been storm chasing, which basically entails driving for hours. and hours. and hours. and hours. and then being excited for seventeen and a half minutes when you finally intercept your tornado. Needless to say, I’ve spent more than enough time in the boyfriend’s Jeep Grand Cherokee. Eventually, I have to find ways to stay entertained (the reading and editing and grading become impossible after each dirt-road jolt that bounces my eyeballs out of focus). So, of course, I resort to finding errors. 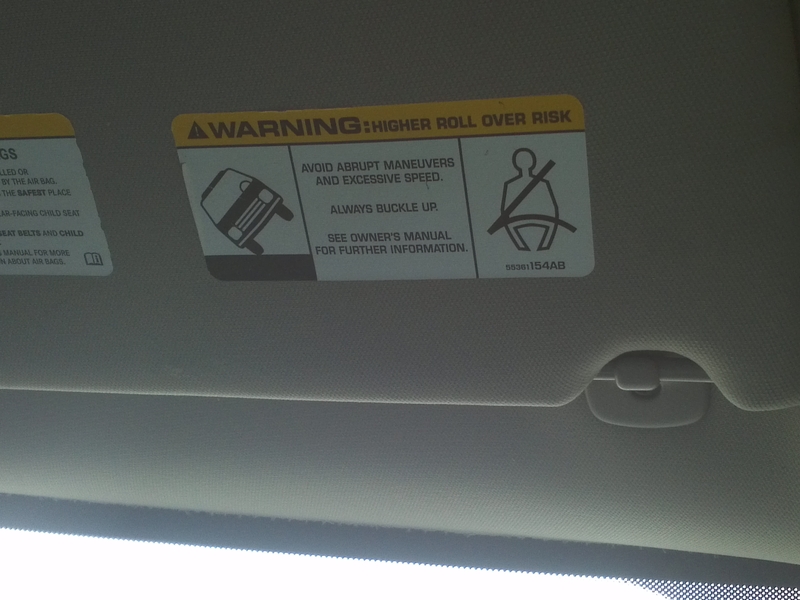 I looked at this diagram on the sun visor many times but never really took the time to focus on the text. I chuckled to myself when I read “Avoid abrupt maneuvers and excessive speed”; our mission is to catch up to and outrun violent storms. And then I looked at the text that should have, in shouting all caps, caught my attention sooner: “WARNING: HIGHER ROLL OVER RISK.” The red-pen alarms went off. When roll over is written as two words, it is a command you should be telling to your dachshund named Brutus. The command is written as two words because it is an action, a verb. To recap: If a verb is what you’re after, use the words roll over. If you are in need of an adjective or noun, however, make sure to use just one word, rollover. Learning this simple rule will put grammar gurus of the past (like Alonzo Reed and Brainerd Kellogg) at ease; they might not roll over in their graves — and would therefore have a much lower rollover risk.